Rafi Sahab sang in many Indian languages including Hindi, Urdu, Punjabi, Bengali, Marathi and Telugu but is primarily remembered for his Hindi songs, which still remain very popular in the Indian subcontinent. Mohd. Rafi was very effective in singing/performing ghazals, qawwalis, or bhajans who has many admirers because of the talent, quality and is regarded as the genius of the entertainment industry, to whose numbers; millions of India’s young hearts from Kashmir to Kanyakumari respond today. Mohd. Rafi, the voice that sang many exquisite tunes; a dream voice of an entire magical era; launched and shaped the careers of many legendary screen personalities. Even to the date, he is extremely popular amongst old and young alike and that shows his true talent and timelessness. For more than three decades Mohd. Rafi went on to become perhaps the most influential male playback singer in Hindi film music whose contribution to Hindi film music is incomparable. Rafi Sahab singing career starts from 1944 till 1980 which means 36 years; we can still recollect the output or the recorded songs of Mohd. Rafi Sahab which comes in between 5,000 ~ 6,000 that have been documented as per the factual database available; but whereas he had performed an estimated 28,000 songs of tall claims too sounds unlikely, and was finally removed from the Guinness Book entries in 1991 being not found as authentic; out of which Rafi had sung 4,516 Hindi film songs, 112 non-Hindi film songs, and 328 private (non-film) songs; the solo songs 2,109 and duets 1,995. Rafi Sahab sang duets with male singers 206 songs and with female singers 1,789 songs. The highest number of duet songs recorded with male singer was Manna Dey that comes around 58 and with female singer was Asha Bhosle that was as near as 764. The above facts & figures are mainly drawn from the Rafi websites and books written on him which need not be considered as a final word or hundred percent correct, as such I have apprehension that even that may lead to controversial views and debates among Rafi fans or music lovers in general. Mohd. Rafi was a religious, humble and soft-spoken; completely different from his all-conquering singing image that would pick up the subtle nuances of the screen character and present them through his songs with such unerring precision that you could close your eyes and still identify the person for whom the song was being picturised. With an unparallel and unique range Mohd. Rafi’s voice was soft and mellow in one instant to robust and forceful in the next, added to his ability to come up with just the right vocal expression and emotion for the screen-character he was singing for. Mohd. Rafi could switch gears so effortlessly that he became the byword in versatility who would do perfect justice to any composer’s tune. Throughout his playback singing career Mohammed Rafi reigned supreme in Bollywood delivering classic numbers with unfailing regularity. The film industry recognized Rafi’s amazing talents and bestowed him with awards and laurels galore. Even though they do not reflect the true ambit of his genius, these awards and laurels nonetheless depict the unsurpassed supremacy of Mohd Rafi in playback singing. In his glittering career, Mohammed Rafi was nominated for the prestigious Filmfare Award a staggering 22 times. His first Filmfare came for the song Chaudvin Ka Chand Ho in the 1961 movie Chaudvin Ka Chand featuring Guru Dutt in the lead role. The song was penned by Shakil Budayuni and composed by Ravi. Mohd Rafi won a total of six Filmfare Awards, the last for the song ‘Kya Hua Tera Vaada‘ in the film ‘Hum Kissise Kum Nahin‘ in 1977. Kya Hua Tera Vaada also helped Rafi clinch his second National Award. This song was written by Majrooh Sultanpuri and composed by R.D. Burman is one of the landmark numbers of Rafi’s career. Rafi won his first National Award for the song Babul Ki Duaen Leti Ja in the 1968 film Neel Kamal. 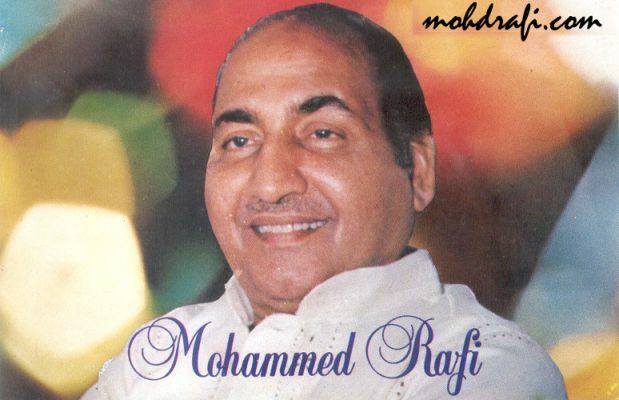 Mohammed Rafi was conferred the prestigious Padma Shri Award by the Indian Government in 1965. Mohd Rafi Sahab should also be given Bharat Ratna and it should have been long long years before. He desrves to be called a Bharat Ratna because he was not only the most popular singer ever but a singer whose voice was called the “Golden Voice”. His songs bring smile, comfort & tears in eyes of millions of people of this country. He is the true ambassador of Indian Music and is Jewel of India. Thirty years after his death still his popularity is never declining. His songs are still requested and played on radio shows. His so many songs brought tears in the eyes of his fans and it is rightly said that Rafi Sahab voice is truly golden voice. I can say that nobody sang bhajans as he has (like a pandit) though he was a devout muslim, nobody could sang patriotic songs still remembers his songs which inspired a generation like,”jahan dal dal par sone ki:, “Ab koi gulshan na ujde ab watan azad hai”.”Ab tumhare hawale watan saathiyon”. Has any other singer inspired so much? We Indians used to sing these songs during 15th August & 26th January, we firmly believe that his songs are our “Dharohar“. We must keep it safely and preserve them for present day generations. Therefore if Bharat Ratna is awarded to him it will give boost to national integration which Mohd. Rafi believed in. Mohammed Rafi is no more but his legacy continues in the scores of unforgettable songs he churned out during his illustrious career. As a playback singer, Rafi’s versatility was unrivaled and his masterful renditions enhanced the screen roles enacted by some of the Bollywood’s greatest actors. It has further been noticed during the recent times that Mohd. Rafi Fans’ Clubs are growing up with tremendous speed and were started few years back by few enthusiastic Mohd. Rafi Fans arranging Rafi programs regularly. This is an effort which would be spread across the country reviving the sweet nostalgia of the days when his numbers were on the lips of most young men and women and promoting local talent as well. The aim for such stage shows is to provide a platform for all the Mohd. Rafi fans to meet, discuss and appreciate all the facets of Rafi’s repertoire. Another main objective of the group is to spread the fragrance of Mohd. Rafi Songs especially among youngsters. The fan clubs are mere organization and the only criterion for membership being the individuals love and knowledge of Mohd. Rafi’s songs. Further Music and film personalities invited for such musical stage programs to share notes on his personal life to describe the lovable adjectives and anecdotes is as much as icing on the cake from bollywood industry. This fan club working tirelessly is a group that is dedicated to Mohd. Rafi Saheb, a well known veteran in the world of Indian playback music and singing who created musical evolution that mesmerized the people with his charismatic performances like nobody had ever done before. To describe the persona called Mohd. Rafi in a few lines or pages is a futile effort, the songs of Rafi Sahab can only be cherished in the memories of his fans, he rules outright on the heart of genuine music lovers who in turn love him relentlessly beyond any limited timeframe. Rafi Sahab passed away on this day (31 July) 30 years ago, but seems as a matter of just yesterday. This day, we all Rafi lovers call it as a “Black Day”. He is remembered today through his songs all over. I pay my full respects to the “Golden-voiced Melody Monarch”, and pray to the Almighty to rest his soul in peace, Amen. This entry was posted on Sunday, July 31st, 2011 at 8:53 am	and is filed under Meri Awaaz Suno. You can follow any responses to this entry through the RSS 2.0 feed. You can leave a response, or trackback from your own site. In West Bengal, at least it has appeared to me that a good section of music lovers know nothing about the divine beauty of Md Rafi sahab’s greatness, he is not remembered as passionately here, as he is in other parts of our country. one important reason might be the fact that, most of the sensitive music lovers are absorbed more in Rabindra sangeet and pure classical music, and 2nd reason may be the fact that two very famous Indian musicians like Salil chowdhury and RD Burman held Kishore very highly and spoke very little about great Md Rafi. But after the emergence of Internet and youtube, it seems the younger generation is becoming gradulaly aware of the greatness of Md Rafi. No significant article has been written on Md Rafi in our leading papers either on his birth or death anniversary. Some one has to come forward and write some sparkling article in leading journal on this greatest musical genius for improving our musical sense atleast. Md Rafi is no doubt the greatest playback singer India has ever produced. It is oftern said that after 1971, his supremacy was eclipsed by Kishore kumar in terms of no. of songs.But we might remind them that from 1952 to 1970 Md Rafi was absolutely unchallanged in the world of singing along with Lata, when all other great singers like hemant kumar, Talat Kishore, Manna Dey were in their prime and had all beauties in their voices.